Helping Cameroon – North American Baptists, Inc.
May the God of peace use His church in Cameroon to provide a peace in Cameroon that surpasses all understanding. Due to the unrest and conflict that continues to spread and intensify, NAB missionaries in Cameroon, together with the Cameroon Baptist Convention, have the opportunity to tangibly meet needs of victims of the conflict. Some of our medical missionaries tend to the wounded on a daily basis. Additionally, the NAB has created the Cameroon Crisis Relief Fund in support of the CBC’s efforts to raise funds to assist in alleviating some of the suffering. Funds will be used to assist payment of medical bills of the wounded, education for displaced children, and food for prisoners. The goal is to raise a minimum of $100,000. Please consider what you can give to assist those who are suffering in Cameroon. You can now give via text. For more details or instructions, click here. As many of our Canadian NAB family is aware, the Canadian Union of Postal Workers is conducting rotating strikes throughout Canada. Mail and parcels are not being delivered or picked up in the impacted areas during their strike activity. If you are affected by this, are unsure how to resume your normal giving, or have any questions, please feel free to contact us by email at the link below or by calling the International Office at (916) 797-6222, and we will assist you however we can. Sorin Crivceag, Iglesia Comunidad West Hills, Salem, Oregon. Pastor Sorin grew up outside of Bucharest, Romania, and his wife, Laura, grew up in Argentina. They met while they were both attending Word of Life Argentina Bible institute. 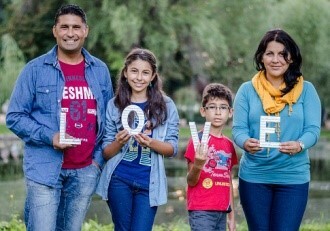 After nearly twenty years of ministry in South America, Romania, and Florida, they moved to Salem, Oregon, in 2015 to work with Hispanics for Christ to plant Iglesia Communidad West Hills. The church officially launched two years ago. Pray the church would be an effective and vibrant witness of Christ’s love in their community. You can visit their website, iglesiacomunidadwh.weebly.com, or their Facebook page, www.facebook.com/IglesiaComunidadWestHills, to keep abreast of what’s happening.